You can see when she is angry. She shared her chewing gum. I would like to visit England. The baby is grabbing her finger. She had a long pinky fingernail. The flamingo was walking by the shore. Put your shirt on the hanger. He puts the hearing aid in his ear. The baby birds are hungry. The jingle bell is hanging on the tree. We saw a kangaroo in Australia. Our bodies have two lungs. The marching band members had practiced hard. Let's play a game of ping pong. She is a very passionate singer. Her hair gets tangled when she sleeps. They are doing the tango. He went biking with friends. She went bowling with her friends. She was driving down the road. Hang on, we will help you. The king makes the rules. It is a long walk to the beach. It is raining down on her. She had a beautiful diamond ring. He enjoyed running in the morning. She was not nervous to sing. Sleeping on the couch for a nap. The spring flipped out of my hand. I hope the bee doesn't sting me. The string on my finger will help me remember. He can lift heavy weight because he is strong. She likes to swing at the playground. Stick your tongue out and say "ahhh". That sign says this is the wrong way. It had been a tough tournament, but Tang had made it to the final round of the ping pong championship in London, England. He taped each finger, had orange chewing gum, and was wearing his kangaroo socks for luck. The final game was the best he ever played. Every swing of his paddle made a point. He was unstoppable! He walked with a spring in his step to receive the ping pong champion trophy. He held his trophy and began to sing. He would remember everything about this moment. It was raining outside, he was hungry, he was breathing deep from his lungs, and felt like doing the tango! He was now king of the ping pong world and nothing could ruin this moment. Except, if he got a bee sting. He was allergic to bee stings. As long as he stayed indoors, he wouldn't have to worry. Kyle played in the school marching band. Tonight, the band was playing Jingle Bells in a nursing home for the holidays. Next week, he would be sleeping in a snow cave at Singer Campground. He was going to have a busy holiday break. Over the break he wanted to go bowling with his family, put all of his clothes on hangers, and practice driving. He had just received his driving permit and couldn't wait to start. He was nervous to drive on the ice. He got angry when he saw others driving fast when the weather was bad. He wished he wouldn't have got his permit until the spring, but was glad he wouldn't have to wait that long. "Driving accidents happen in the spring too," he thought. He started to get hungry. "Let's go to King Hot Dogs and get some dinner," he said. The marching band, Jingle Bells' singer, and Kyle finished their songs, hopped in their parent's van, and drove to the restaurant. This list of functional words was professionally selected to be the most useful for a child or adult who has difficulty with producing the "NG" sound. 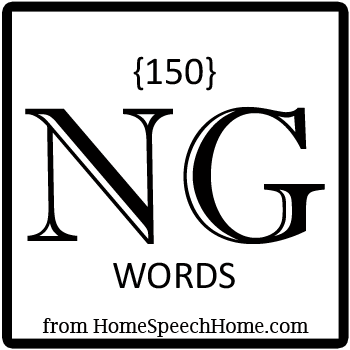 Every day that your child goes without practice it becomes more and more difficult to correct an "NG" error because he/she continues to say it incorrectly.